As a registered investment adviser, we work as a fiduciary when we give advice and manage money. We often try to approach our blog topics with a light touch and a sense of fun. We believe a little humor helps us communicate important financial issues more effectively. With this in mind, we think many people often feel that having to deal with financial matters is like having to visit the dentist – it may be necessary but not exactly something to look forward to. No disrespect meant to our dentist friends. They understand. This article, however, is about something we take very seriously: Our fiduciary obligation to you, our client. 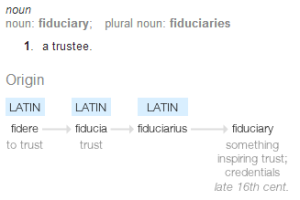 Put simply, a fiduciary duty is the duty to put your interests ahead of our own in everything we do. It’s a legal standard we follow, but in our view, also a moral obligation we willingly accept.